Mired in the middle of an intense playoff race and hoping to add some youthful spark to a team full of aging veterans, the Miami Marlins purchased the contracts of outfielders Christian Yelich and Jake Marisnick today. The Marlins are just really bad – especially offensively – and decided to try and be a little less terrible offensively now that the potential for Super-Two status is well in the rear-view mirror. 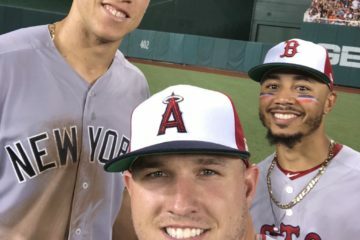 That being said, now that Yelich and Marisnick are joining Jose Fernandez, Jacob Turner, Rob Brantly, Adeiny Hechavarria and, of course, Giancarlo Stanton in the majors, we’re finally starting to see the framework of what should be the Next Competitive Marlins Team two or three seasons down the line. But if you’re a dynasty, keeper or redraft league owner, you don’t care about that right now. You just want to know what Yelich and Marisnick can do now, and what they’re likely to do in the future. The good news: they’re both likely to be Fantasy assets for a long time to come. The bad news: neither is likely to help you much in 2013. And yet despite those similarities, Yelich and Marisnick are very different players. Yelich has been the golden child of the Marlins farm system for a while now, displaying one of the minor’s prettiest swings and flashing what could be a grade 65-70 hit tool by many accounts. He was stellar in Single-A in 2011 and High-A in 2012, hitting well above .300 and reaching base at around a .400 clip both years. This season, in 220 PA in Double-A, Yelich hit a more modest .277/.364/.518 with 7 homers and 5 steals, which was still good for a wRC+ of 153. His pitch recognition skills and plate approach continue to impress, and scouts believe he has the range (if not the arm) to play an above-average center field. The only real negative with Yelich comes from his platoon splits, which many figured out he’d eventually solve but which have continued to plague him throughout his MiLB career. A left-handed hitter, Yelich is hitting “just” .269 against fellow southpaws, as opposed to .334 against righties for his career. This year, the divide has worsened, as he’s hitting .203 against lefties and .312 against righties. For Yelich to live up to the massive potential so many see in him, he’ll need to make at least a modest adjustment. Whereas Yelich has a smooth swing and is more polish than tools, Marisnick is pretty much the exact opposite. Acquired from the Blue Jays in the Jose Reyes megadeal, Marisnick has experienced a turbulent MiLB career, bursting onto the seen in 2011, faltering in 2012 and redeeming himself in this season with an excellent 2013 campaign. In fact, through 298 PA in Double-A this year, Marisnick has put up a stat line pretty similar to Yelich’s. He’s hitting .294/.358/.502 with 12 homers and 11 steals, and his wRC+ sits at 150. It’s partially fueled by a .351 BABIP, and Marisnick’s 5.7% walk rate leaves much to be desired, but the numbers are there nonetheless. Despite the somewhat similar end results, the way Marisnick derives his value is much different from how Yelich goes about that task. 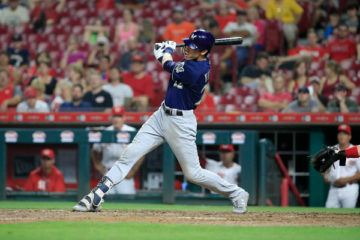 He’s a potential grade-70 defender in center with more natural speed and power than Yelich, and while the swing is less refined, he’s demonstrated a more advanced approach than the one he’s currently showing in the past. When you break down the numbers and projections this way, it starts to appear pretty odd that Yelich is essentially a household name amongst anyone with a passing interest in MiLB, while Marisnick is universally regarded as the inferior prospect. I’m arguing that Yelich is indeed a better prospect, but that it’s very close, and that in the short term Marisnick is actually the better play. Yelich is a safe bet to be a productive major leaguer and a pretty good bet to be an above average one. Even if he never really sorts out his issues against left-handers – and there’s no reason to think he can’t make a modest adjustment in time – he’ll hit over .300 against righties with a high OBP, and he should grow into 20-homer power with the ability to swipe 10-or-so bags a season. He won’t be an impact defender in center, but he can play the position, and that’s a player with a lot of value. And that doesn’t speak to what Yelich could be if he really puts it all together. If that happens, we’re talking about someone who can push for a .300/.400/.500 line while playing in the middle of the diamond: that’s an All-Star. Marisnick, on the other hand, has a much lower floor. He’ll spend many years on an MLB roster because of his defense, but not everyone loves the swing and it’s possible he turns into a Drew Stubbs-like player. His upside, though, would see him play closer to the level of the 2013 version of Colby Rasmus, but with more baserunning savvy. When you break Yelich and Marisnick down like this, it becomes apparent that the player you should target isn’t cut and dry. It really depends on your team needs. If you’re floundering in batting average or play in an OBP league, Yelich is the safer bet and a nice grab. I don’t think he’ll set the world on fire this season, but if he can play well enough to earn a fulltime spot in 2014 he could start to do some damage then. If you’re more interested in boosting your counting stats, Marisnick is the wiser gamble. Again, don’t bank on much for 2013, but he could be a force down the line. On my personal midseason Top 25 rankings, I slotted Yelich in at 14 and Marisnick in at 22. There’s some personal bias here, to be sure: I’ve long been a bit lower on Yelich than the industry, and conversely I’ve generally been a bit higher on Marisnick. But when you break the argument down this way, I think it’s one that makes sense. So go forth and reel in your new Marlins outfielders, but understand that from a Fantasy perspective, Yelich may not be your biggest prize. Great analysis. Considering an add of Marisnick but the walk rate scares me. Tools are hard to deny though. . . I see Marisnick as more of a No. 5/6 hitter in the long run, although if it all clicks he could be a middle of the order guy in his absolute prime. Thanks Andy. I think you have it right: this is really a question of consistency/floor vs. upside/bust potential. Both are exciting players to monitor.